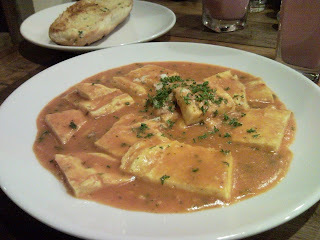 Bangalore restaurants- Food and Travel: The Egg Factory - YUMMMYYYYY!!!!! The Egg Factory - YUMMMYYYYY!!!!! The Egg Factory is a restaurant we read about in the Food Lover's Magazine. The review was simple and set the tastebuds in anticipation. And so off we went over the weekend to The Egg Factory. The place is located off St Marks Road and is right behind the Dewar Wine store. You cannot miss the wine store since the place is choc-a-bloc with customers to its premises as well as to other watering-holes surrounding it. The Egg Factory is on the first floor of the White House. The decor of the place goes with the name - factory style... wooden interiors with black spray paint. The seating is steel chairs and tables or wooden benches with rectangular rexine cushions. The menu card is like a product manual. In all international languages. Its quite fun to read. The menu is interesting and not largely extensive which makes making a choice so much easier. To begin with we ordered drinks, which no, were not egg based. I had the Fruit Blast which was Banana, strawberry, orange juice, yoghurt and milk. 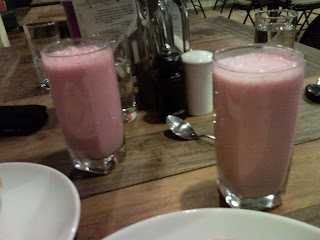 Sudhakar opted for the Pink Lady, cherries, almond, banana, yoghurt and milk. When the drinks came they were both pink and we were wondering how different the tastes would be. But, boy did they taste different and good. Mine was on the heavier side, while Sudhakar's was more lighter. Both equally heavenly. Since both of us studied in Manipal, sudhakar for a longer time than me, he decided to opt for something from the Manipal special section - So Mota Special it was for him. Mota Special was served only at Kamaths in Manipal, and in Sudhakar's words, though it was a good attempt, it was no where close to the original. This does not go to say that it was bad. Mota Special that was served, came with buttered bread, you also got packaged butter and jam with it. 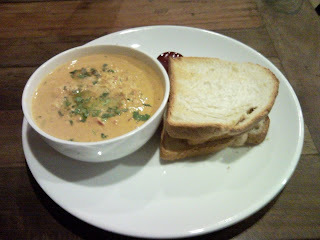 The egg was a scrambled egg gravy in a coconut based sauce which was rich and flavourful, slightly on the spicier side. For the main course, I ordered the Frittata in Tomato sauce. The dish is a thick fluffy three-egg omelette that has been cut into neat rectangles and dunked in this creamy tomato sauce and garnished with mint and coriander. The dish comes with a huge serving a garlic bread and the combo is awesome. For Anoushka we ordered the omelette gravy and paratha combo and boy did we underestimate the quantity of the dish. 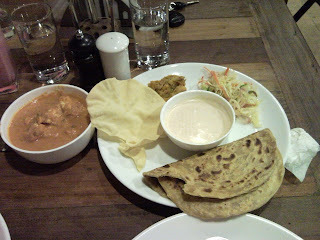 There came, two big parathas, a huge bowl of gravy, a mixed veg sabzi, spiced curd, papad and coleslaw. Anoushka gladly finished the parathas while we parcelled the gravy for breakfast. For dessert we ordered the bread custard, which I was very sure would be bread pudding. 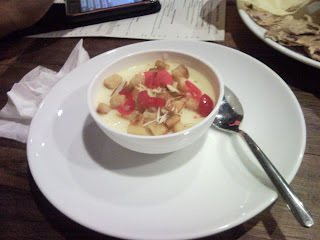 However what came was a heavenly cold custard which was covered with small toasted sweet bread squares. An excellent way to end a satisfying meal. Now for the wallet factor - gosh I could eat here all day, all year. All this for two people and a kid came to Rs 518 - thats all. The place is air-conditioned, toilets are clean, no baby chairs though and the service prompt and effecient. There are also on the menu, ragouts, spaghettis, the customary biryanis and fried rices, but if you really want to enjoy your eggs, then opt for the newer recipes.